The Two Minds of Socrates is the second play to come from the minds of student production group ‘VETO’, following last year’s ‘Helter Skelter’. The play is set the day before Ancient Greek philosopher, Socrates’ trial and the dialogue is exchanged between Socrates and his subconscious manifested in multiple characters- acting as a ‘rehearsal’ for his trial. However, Walker Zupp’s script is scattered with so much humour and variety, that the play seems completely relevant and of great interest to a modern-day audience. The character of Socrates, played by Stef Rasmussen, was made relatable and humorous with a distinct Yorkshire accent, especially in contrast to his traditional Ancient Greek dress. Despite this, the dialogue was intelligent, and the character’s ‘wisdom’ carried convincingly. In fact, all characters were portrayed with a unique level of quirkiness which brought real charm to the production. Socrates’ main subconscious partner, played by Mike Narouei, accompanied him on the stage for most of the film dressed in a suave suit jacket and slicked back hair. He effortlessly injected humour and light moments, delivered with a bizarre accent, into the otherwise heavy subject matter. However, for me, the highlight was Meletus, Socrates’ prosecutor, played by Liam Cain. He perfected the role as a cocky, easily swayed, disenfranchised member of society. His character was reminiscent of many personalities in today’s society relating to current issues like Brexit, who own such a strong opinion, but with no grounding; motives mainly being to oppose the elite. This made the prosecution of Socrates all the more powerful for me. The design of the production stood-out in comparison to many student plays. The setting was minimalist, simply two pieces of beige board, however, that became integral to the mood of the production. Throughout, characters wrote and drew key pieces of their dialogue on the board, which they continued to perform in front of. “You want me dead” was a particularly memorable scribble, creating an undeniable tone shift towards the darker climax. In addition, the sound design was stunning and created a relaxing atmosphere upon scene changes. With such minimalist staging, the distinct use of sound worked as a clever contrast. And the use of voiceover clips to further emphasise themes worked perfectly and made aspects of the plot and dialogue more manageable in moments where the philosophy levels became overwhelming. Perhaps to students of philosophy or ancient history, this production would have earned five stars, since it spun an inventive twist to the telling of the already known Socrates and Plato’s Apology. However, VETO had the hard task of informing most of the audience about Socrates, as well as performing the story in an interesting way. At times I felt like I had a slight lack of interest in Socrates and the play, but simply due to a lack of knowledge of the subject. Maybe some background detail of the political context of the time or of Socrates himself, could have been introduced to further solidify the production and make it more accessible to a general audience. 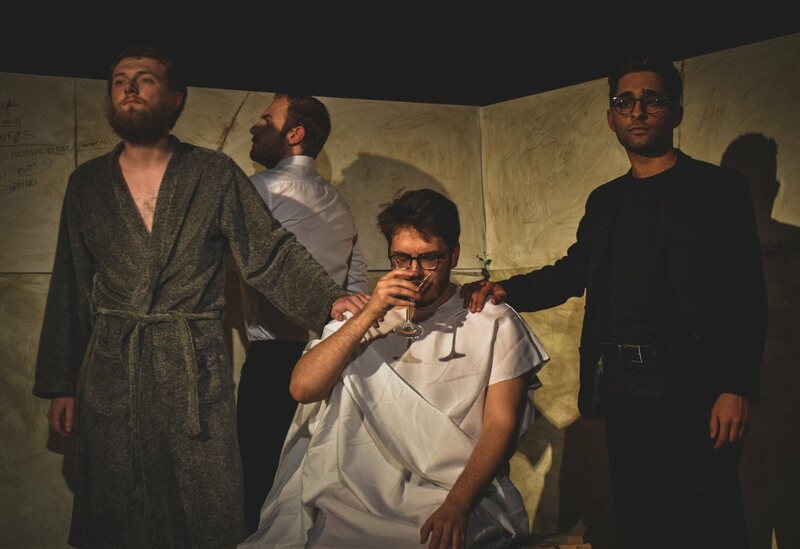 However, VETO have created an impressive original production that takes on a daring subject matter, and executes it in an original, modern style. The Two Minds of Socrates will be remembered for this reason, and VETO productions continue to strengthen their reputation as Lancaster’s rising stars of theatre.